High quality education is a vital weapon which South Africa needs to assist in the fight to reduce poverty and grow its economy. Juta and Company may be the oldest publishing house of student textbooks in South Africa, founded almost 160 years ago, but their view on education is modern and progressive. 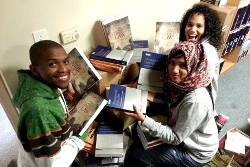 Juta’s commitment to social change through education explains their long-term support of the Tertiary School in Business Education (TSiBA), a not-for-profit higher education institution, donating to TSiBA most of its academic textbooks since 2005. To date the value of their donation-in-kind is valued at approximately R2 million. What makes TSiBA so unique is that all the leadership and entrepreneurship students are on full tuition scholarships. TSiBA does not require students to pay back the institution for their studies, but rather to ‘Pay it Forward’ to their community. In this way TSiBA’s vision of ‘igniting opportunity’ is realised by providing a high- quality, accredited business degree to those who would otherwise not have had the means to study at tertiary level.